My husband and I had two opposite role models to follow about sharing personal information with adult children. My father, a bank manager, would come home upset some evenings because he was dealing with the widow of a colleague, who had no idea about her husband’s salary, where the money was, and how she should manage. This was the 1950’s when being a wife and homemaker was a major role for women. He was determined that my mother and his children would never be in such a position. He told my mother that since he managed other people’s money, she could run the household finances. As my parents aged, and my brother and I grew into responsible adults, they were open with us. My father regularly showed me his filing system and records and my parents talked openly about their wills. At this point, we had no idea of how much money they had – this was private information. We just knew where to look, “in case of”. In their mid-80s my parents became increasingly open, and after my father died, my mother, then 86, saw to it that both my brother and I received copies of her monthly investment and financial statements so we could ensure some unscrupulous person was not taking advantage of her. My in-laws were the complete opposite. They never talked about their personal affairs, and they strongly discouraged any queries. I know they wanted to protect us from their problems. When first my mother-in-law started to show signs of dementia, and then my father-in-law was temporarily affected by a back condition, I became really concerned. “If something happens to your father,” I said to my spouse, “your mother cannot manage and no-one will know what is going on. You need to talk to your father. You don’t need to know how much money they have, but you need to know where it and the records are”. I could see how worried my husband was after a difficult visit trying to obtain the information from his parents. He was also concerned about our kids. We decided to have regular conversations with our children now while we are both still in excellent health and have our marbles (well, most of them) as to the state of our health and finances, and any other important information. And so I developed and computerized a form for our use that I call “Stuff You Need to Know in Case of Serious Illness or Death “. It lists everything you would want to know if someone you love is unable to communicate – where wills, credit cards, social insurance numbers, pension and health care information, insurance, bank accounts, investment account numbers, etc. are stored and who to contact. It doesn’t give them specifics about how much money we have, but it lets them know where it is. It takes time to gather the information the first time, but being computerized, the form is easy to update, which we do every year. Our kids get an updated copy at an annual discussion. We have also asked them to fill it in for themselves – this makes an executor’s job easier. We want them to have wills, powers of attorney and named guardians for their kids, “in case of…”. We have stored in our safe, Financial and Health Care Powers of Attorney which they can exercise (they have the combination) and copies of our wills which we update every five years. We talk about what treatment we would like in the event of a health care crisis. We talk about the state of our physical and mental health, and tell them they can ask questions any time. We want them to raise concerns rather than worry in silence. They have a letter (which our doctor also has) that says he can talk to them about any concerns they have with our health. Because we are in good health (mental and physical), they don’t ask many questions – in fact, we think it makes them a bit uncomfortable, but it’s an important conversation to have. As we get older, we plan to provide them with more information about our financial situation, and have them get copies of our statements, so they can ensure we are not being hoodwinked. This means we have to trust our children, but happily, we do. We hope we have the mental capacity and the good judgment to recognize when we might need additional oversight. But if not, at least they will have the tools needed to ensure we are treated appropriately. 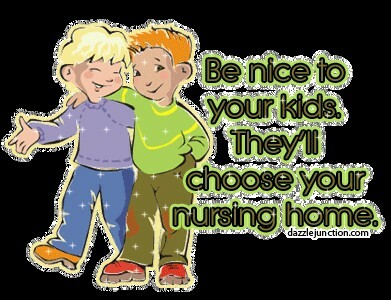 Personally, I want to go to a NICE nursing home and my son knows this!